If you’re a bicyclist currently residing on Planet Earth, chances are you’ve had a conversation about bike share recently. I know I’ve had my fair share. They usually start with Oh, you ride a bike? and immediately move to, I was just in Manhattan, and those blue bikes are everywhere so how does it work, anyway? The Bicycle Coalition’s Diana Owens Steif and the author enjoy Washington DC’s Capital Bikeshare. The problem is, just because you ride a bike doesn’t mean you’re automatically an expert on bike share. After all, Philadelphia doesn’t yet have a bike share system of its own. As bike share proliferates in cities around the world and inches ever-closer to rollout in Philly (Fall 2014, folks! ), we bicyclists are going to have more and more opportunities to educate the bike-share-curious. Arm yourself with these five key points and you’ll be able to get through your next bike share conversation with ease  and to get everyone else as excited for bike sharing as you are or should be! Bike sharing is basically the love child of bicycling and public transit. In a city with bike share, there are docking stations with bicycles all exactly the same  strategically placed around the city, sort of like bus stops. To use them, head to the nearest station, swipe a credit card or member key, and hop on a bike. Ride the bike to the docking station closest to your destination and leave it there; there’s no need to bring it back to where you got it. Heading back, say, after work? Grab a new bike and do the same thing in reverse. It’s flexible, it’s easy, and it’s usually pretty cost-effective as well. While we don’t yet know what Philadelphia’s pricing will look like, most systems charge users a modest upfront membership fee, either short-term (one to three days) or long-term (monthly or annually). With these systems each individual ride is at no extra charge, as long as you re-dock the bike within a given time limit, which is usually around 30 minutes. You get charged a fee if you keep a bike for longer than that. This is done to make the system work well for short trips and to let a limited number of bikes work for large numbers of people. 2. Where will the stations be? Philadelphia hasn’t yet chosen the specific station sites. We do, however, know the approximate reach of the system as it rolls out in phases (see map below). Initially, the system will at least cover Center City Philadelphia, as well as reaching up to cover Temple’s campus and west to cover University City. In Phase 2 probably the following year the plan is to extend the system further South, West, and North (sorry, New Jersey). Exact station locations will be determined by a combination of spatial availability and careful analysis of where bike share trip origins and endpoints are most likely to be. Have an idea for a station location? Feel free to share it! Let the city know where you want bike share stations at www.PHLbikesharemap.com. You can suggest a bike share station location, endorse an existing suggested location, or comment on how many bikes should be at that station. 3. Who will use it? There are a lot of misunderstandings about this. It is important to remember that the great strength of bike share is that it is inviting to folks who haven’t necessarily traveled by bike in the city before. Bike share greatly reduces the upfront cost and commitment involved in purchasing a personal bicycle and eliminates maintenance costs and concerns about storage and parking. It’s perfect for people who have always wanted to try biking in the city, but haven’t quite done it yet. That being said, Philadelphia’s current bicyclists should be happy about bike share, too. As I explained in an Axis Philly article earlier this year, bike share will get more bikes on the roads, making streets safer for all cyclists and driving a greater push for bike infrastructure. I also plan on using it for one-way trips, and I’m excited to put my friends on bike share bikes when they come to visit me. A lot of people also think that bike share is mostly for tourists  not so! Tourists will certainly use bike share, but the majority of trips in existing bike share systems, such as Capital Bikeshare in Washington DC, are actually made by monthly or annual members, who tend to be residents. Finally, there is a pressing need, and vital opportunity, around the question of how to make sure bike share serves all Philadelphians. Other systems have struggled to try to get bike share ridership to reflect the diversity of their cities along class and race lines. Bike share, if rolled out inclusively, could be an incredible opportunity to diversify our city’s biking community. I hope to see careful thought put into equity concerns in decisions about station placement and system pricing, as well a commitment to robust community engagement on the neighborhood level as the stations go live next fall. I almost hate to bring this up, because the Great Helmet Debate tends to derail a productive bike share conversation. The short answer: most bike share systems encourage, but do not require, riders to wear helmets. They follow the prevailing helmet laws. Personally, if I’m traveling to a city with bike share, I hook my helmet onto my backpack and take it with me like the bike nerd that I am. But the spontaneity of bike share gets lost pretty quickly if users have to track down helmets before they hop on a bike. Wearing a helmet is a personal choice  I choose to wear one, but yes, there will probably be many bike share users who do not. 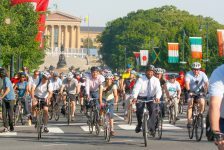 Helmeted or not, a surging population of Philadelphia bicyclists in our city will experience the myriad health benefits that go along with getting more physical activity on an everyday basis. Hearteningly, other cities with bike share have seen very low crash rates for bike share users, perhaps partially because having more bikes on the road tends to make roads safer for everyone. As of next year, you won’t have to travel to DC or NYC to ride one of these. 5. Where is Philadelphia in this process? 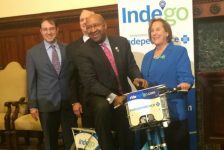 The Mayor’s Office of Transportation and Utilities, which is in charge of bringing a bike share system to Philadelphia, issued a Request for Proposals this fall. 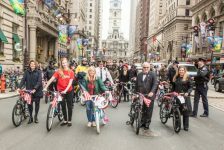 Companies interested in being contracted to run Philly’s bike share system submitted their proposals by December 5th. The City of Philadelphia hopes to select a finalist by mid-February and get rolling with the site planning process in March and April. Expect more exciting announcements in the near future: Stay tuned to www.phila.gov/bikeshare for updates! Can’t wait a year to try it? Pack your helmet for your holiday travels! Bike share systems are popping up in new cities every day, so there are many opportunities to try it in other cities as we wait for our own system to launch.